Have you ever had a "Staycation"? It's a fairly new thing that's become popular in the last few years. Basically a staycation is like a vacation, except you stay in your on city/town or somewhere close to home and visit local attractions. When you have a small budget, but need or want to getaway and can't afford a real vacation, you can have a staycation. This is totally an internet thing, someone made up and it just took off. I had never had a staycation and honestly when I first heard about it thought it was a silly thing. Well this past weekend I was able to have my own staycation and you know what, it was pretty cool! I won a prize last year from the Visit Anaheim visitors bureau, during a contest they had on my block. We have a weekly farmers market and Visit Anaheim was here for a promotional event. I was just walking to my building and was approached to enter the contest. I initially didn't want to do it because, I live in Anaheim and thought what's the point...LOL It seemed easy and harmless, just take picture, post it to Instagram and use a hashtag. I did it and went along my business. A week later I received a message on Instagram saying I won! I was pretty excited, since it's not everyday you get to win a contest. My prize consisted of tickets to Knott's Berry Farm, Medieval Times, Billy Beez and a 2 night stay at a local hotel. How cool is that, this is probably the biggest prize I have ever won! Most of my prizes I shared with friends and family, and kept the hotel certificate. It was about to expire this month, so I took advatnage and booked my 2 nights at the Anaheim Majestic Garden Hotel. I have driven by this hotel many times, since it's across the street from Disneyland. Honestly it doesn't look like much, just a regular hotel in Anaheim. I was very pleasantly surprised when I arrived and checked in to the hotel. After checking in and dropping off our bags, we took a walk around the property. First let me explain the hotel is castle theme, and it looks like one from the outside. It has brick walls and pointed roof tops, reminds me of medieval era. The hallways have pictures with stories of dragons and princesses painted on the walls. As we made our way to find the pool we found pathways leading to gazebos, gardens and a koi pond. I was so surprised to see such beautiful and lush greenery, gardens and flowers all within the brick walls of the hotel. 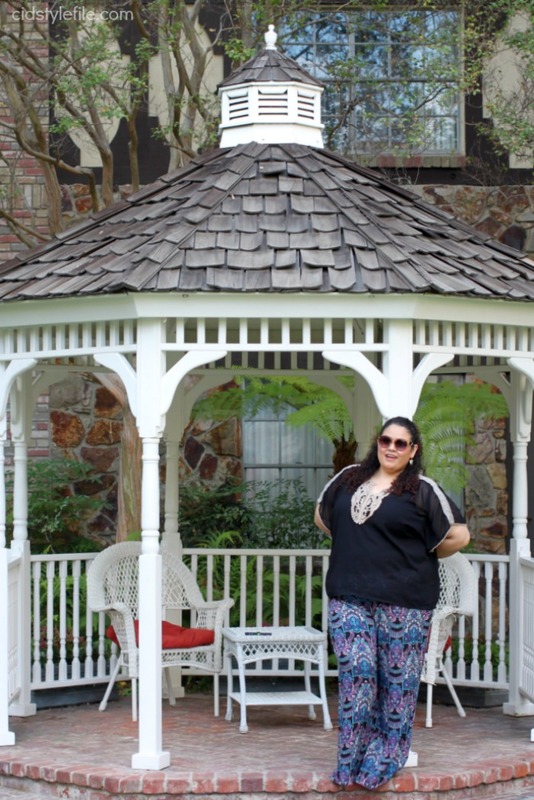 Being at the Anaheim Majestic Garden Hotel reminded me of a fairy tale, and I truly felt as if I was in a faraway land and not a few miles away from home. The koi pond was my favorite, very serene and peaceful. This staycation was turning out to be great and just being able to lounge around was wonderful. We discovered new places around Anaheim, some we drive by all the time and never even noticed. Its good to be a tourist in your own city or town sometimes. You never know what you may have missed on you daily drive to and from work. The hotel brags about having one of the best spots to view the Disneyland fireworks, with out being in the actual park. I had to see for my self, since I too have partial view of the fireworks from my bedroom window. We made our way to the parking lot at 9:30 pm to find a crowd of people waiting for the show. Once the first firework went off I knew this was going to be special. The fireworks are so close, you can see them shooting up into the sky from across the street. This was the best I've ever seen the fireworks, they seem to be showering over you. The colors are so vivid and loud, it was magical...the hotel did not disappoint with their claims. Overall I was pleased with our first staycation, we relaxed, ate at some new local places and enjoyed the beautiful grounds at the hotel. Of course I had to take advantage of the gardens for some outfit pictures. Since I was on staycation, my outfit was very relaxed, with minimal accessories. I wanted to be comfy and cool, since the weather was quite warm. 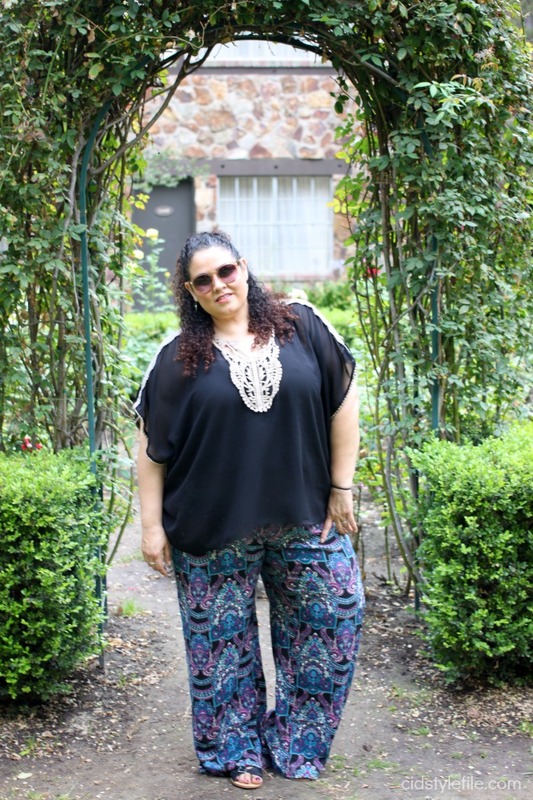 These wide leg pants kept me cool all day long and into the evening. By the way this is not a sponsored post, I wasn't even asked to write about it. I am just sharing my staycation experience. You should come visit Anaheim, we have more to offer than just Disneyland! Have you ever had a staycation? What is your favorite thing to do in your city? 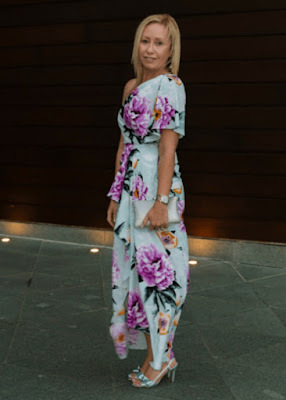 Thank you for linking up, I am happy to see many bloggers return each week. I hope to see more new faces linkup each week. Remember to follow me on social media and share with your other blogger buddies to come link up every Friday with #UntamedStyle. Allison looks gorgeous in her one shoulder dress. I love a good floral print dress! I gasped at Joi's picture with her butterfly duster coat. It so chic and looks a bit vintage. Rebecca is a fellow bargain hunter. She looks so cute and happy in her fringe vest. I love Jessica's jeans, they have a retro aesthetic, yet so modern. She looks so chic in this outfit and I would totally wear it too! Off the shoulder tops are so in right now. Talitha look so cute with her top and lace details. Follow Host (CidStyleFile) on your favorite social media channel, mine is Instagram! I'll keep you posted and remind you of the monthly themes and dates to post. Find Me Here Facebook- Instagram - Twitter - Snapchat. Share is caring! Share on Social Media you are linking up to #UntamedStyle, invite your other blogger boos to join too! Be Social! Visit and interact with other bloggers who link up! You will find and meet plenty of new (to you) bloggers and they will get to know you too! Hello isn't it all about empowering and encouraging each other! No Haters, Shaders or Drama Here!!! You may be featured! I will select my favorite 5 blogs who link up, and will feature them the following month. Be creative, have fun and just be YOU!! 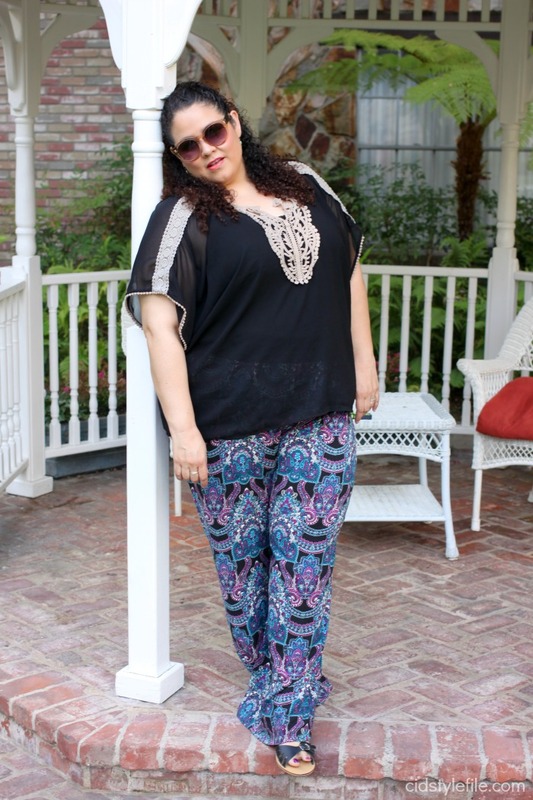 Time to linkup for this weeks #UntamedStyle. We are continuing the Summer Style Theme for the entire month of June. 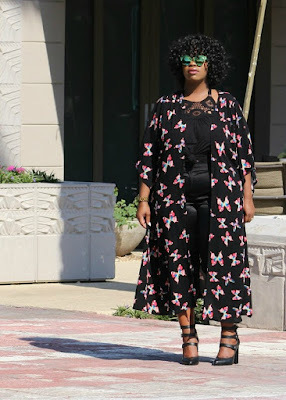 Come share you summer outfits, makeup looks or any other summer style post you may have. You may see yourself as my 5 fave bloggers next week! Also make sure you follow me on Facebook and Instagram. If you would like to be a co-host one week shoot me an email: info at veronicacid.com Thanks for linking up! 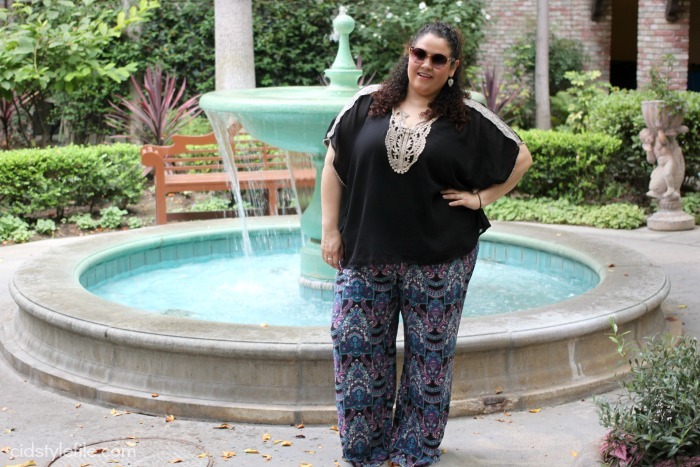 Love your cool boho style! Happy holiday weekend! First---how totally exciting to have won that!! It's such a rush to win contests! 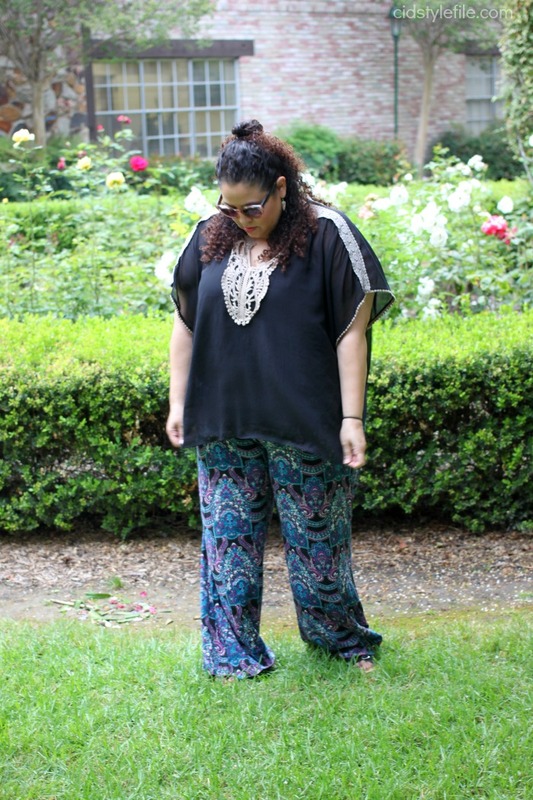 Second...I really love the pants--perfect for the summer heat! What a cool weekend get away and super close to home! And for free. You can't beat that! I love this adorable outfit. It is super flattering and the colors and print are amazing. Remember to come link up with me today as well! Have a fantastic weekend. Thanks for linking up On the Edge of the Week! I hope to see you again next Friday. Your pants look super cool! I remember hearing first about staycations during the great recession. People still needed a break but just couldn't spend the money. When we lived in San Diego we did the same thing the tourists did and it was a fun staycation b/c we could still sleep in our comfy bed and b/c we had a toddler we still had all the baby stuff to make life bearable. Glad you enjoyed yours! Wow, what a great prize! And, you had a gorgeous location for a photo shoot. 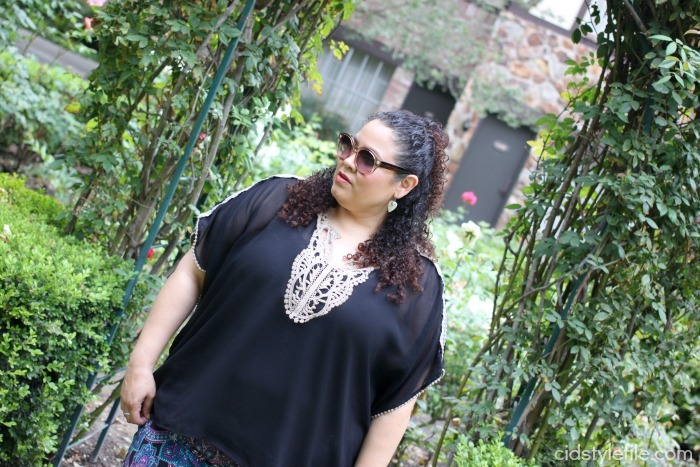 Sorry, I am a little slow to visit all you linkers from the July My Refined Style Linkup. Thanks for bringing your fabulous flair to our party.